3:40pm: Heyman tweets the full breakdown. Kepler earns successive salaries of $6MM, $6.25MM, $6.5MM, $6.75MM, and $8.5MM and will then receive either a $10MM salary or $1MM buyout. That 2024 option year salary can increase by up to $1MM based upon awards. 11:25am: It’s a five-year deal worth $35MM for Kepler, reports MLB Network’s Jon Heyman (via Twitter). The deal also contains a club option for a sixth season, which is valued at $10MM, according to ESPN’s Jeff Passan (Twitter link). 10:25am: The Twins are nearing the completion of a new contract with right fielder Max Kepler, Phil Miller of the Minneapolis Star Tribune reports. If and when the deal is completed, it’d be the second long-term deal hammered out by the Twins this week, as the team is also reported to be finalizing a five-year pact with shortstop Jorge Polanco. The Twins, notably, have scheduled a press conference for 10am tomorrow morning. Kepler is represented by Sosnick, Cobbe & Karon. If Kepler can bounce back in terms of BABIP against righties and maintain some of last year’s gains against lefties, there’s reason to expect the outfielder’s best season yet. Beyond that fairly rudimentary look at Kepler’s splits, he improved his walk rate to a career-high 11.6 percent in 2018 while slashing his strikeout rate to a career-low 15.7 percent. It’s also worth noting that the Berlin native also has less overall experience with baseball than most young players at his age, given baseball’s lack of popularity in his home country. As things stand, Kepler will reprise his role as the everyday right fielder, with Eddie Rosario lining up in left and Minnesota once again hoping to see former No. 2 overall pick and top overall prospect Byron Buxton solidify himself at the Major League level. Buxton looked to be well on his way to breaking out as a star in 2017, but a series of injuries torpedoed his 2018 season and rendered him a question mark in 2019. He’ll get the first crack at regular work in center field, though the Twins also have Jake Cave on hand should Buxton struggle or be slowed by injuries once again. Both Kepler and Rosario can handle center field, as well. A look at recent comparables in MLBTR’s Extension Tracker — specifically, Super Two outfielders with two to three years of service — Ender Inciarte stands out as a potentially relevant data point. The Braves’ center fielder signed an extension at the same age Kepler is now and with nearly identical service time, agreeing to a five-year pact worth $30.525MM prior to the 2017 campaign. Something in that range for Kepler could very well be plausible, though presumably his camp would like to top that mark in any negotiations. As noted when looking at Polanco’s soon-to-be-finalized extension, the Twins don’t have a single guaranteed contract on the books beyond the 2019 season. Polanco and Kepler would change that fact and give the Minnesota organization additional cost certainty as it looks to supplement a roster that is largely comprised of young assets who are still years from reaching the open market. It’s possible that additional extensions could yet come to fruition, with Rosario and Jose Berrios standing out as prominent young Twins who the organization would surely like to retain for a longer period of time. 1:37pm: Rosario is one of the players who turned down an offer, Darren Wolfson of 1500 ESPN tweets. 9:30am: The Twins were long rumored to be chatting with center fielder Byron Buxton about a new contract this spring. But it seems he was not the only target for an organization that was evidently hoping to enhance the value of some existing player control rights. Per Jeff Passan of Yahoo Sports, via Twitter, the club pursued long-term arrangements with four other young players as well. Two of those targets are identified in the report: righty Jose Berrios and outfielder Max Kepler. The remaining pair is not known, though perhaps it’s not unreasonable to surmise that one of them was shortstop Jorge Polanco, who had a solid 2017 campaign but ended up being suspended for half of the 2018 season. Outfielder Eddie Rosario seems to be another likely candidate, as the front office has made clear they see him “as part of the core.” Star third bagger Miguel Sano would also be a hypothetical target, no doubt, though perhaps he was not likely to be approached during an offseason in which he was under league investigation for an alleged assault. Obviously, none of those discussions led to agreements. Perhaps, though, they could still set the stage for eventual deals. Buxton, who is entering his final season before beginning the arbitration process, was the most obvious target from the get-go. He turned in a breakout second half at the plate and was an outstanding defender and baserunner all season long. But those previously reported talks seemingly fizzled, leaving the team to renew the 24-year-old’s contract late this spring. It’s hardly surprising to hear of interest in Berrios, either, as he also overcame some initial MLB struggles to turn in an impressive 2017 effort. He’s a year further from the arb process (and free agency) than Buxton, but that also surely left the team intrigued at the potential value it might achieve. Berrios said a month ago that he had not been approached, so it appears that the chatter took place in the interim. Then, there’s Kepler, who’s in an in-between position from the other two players in terms of service time. He’s on track to reach Super Two status next winter but, like Berrios, can’t accrue more than six years of MLB time until the end of the 2022 season. The 25-year-old has, to date, been a solid performer, turning in two seasons as a roughly average hitter, solid defender, and good baserunner at a corner outfield spot. Kepler’s profile is not quite as exciting as those of his aforementioned teammates, but at the right price he could also certainly make sense for a long-term deal, particularly if the club believes there’s still some developmental upside remaining to be tapped into. In any event, none of those players have inked contracts prior to the start of the current campaign. While something could, in theory, come together at any time, Passan does say that all of the players in question turned down the offers they were presented at the time. It usually isn’t a good tactic for free agents to accept the first offer that comes their way, yet this past offseason, FanRag Sports’ Jon Heyman notes that several players would have been better served by accepting deals before the new collective bargaining agreement was finalized. Many free agents, particularly sluggers like Mark Trumbo, saw their offers drop after the new CBA was settled in early December, as teams were suddenly more wary about spending in the wake of more punitive luxury tax rules. Trumbo tells Heyman that he doesn’t regret returning to the Orioles on a three-year, $37.5MM deal, though the implication was that a larger offer was on the table for an undetermined amount. Reports from earlier this winter indicated that the Orioles themselves initially offered Trumbo a larger deal in the four-year, $52MM range. The Rangers have increased their offer in extension talks with Rougned Odor, though “it isn’t believed to be where the player wants it to be.” Heyman suggests that Odor’s representation could see Jason Kipnis’ six-year, $52.5MM extension with the Indians “as a baseline,” whereas the last time we heard of talks between the two sides, Texas had offered a deal only “in the range of” the Kipnis deal. Odor’s team isn’t expected to make a counter offer, so Heyman feels the talks could be tabled altogether. There isn’t necessarily any rush to get an extension done, as Odor is still under team control for four more years, though he’ll start to get more expensive next winter when he becomes eligible for arbitration. There aren’t any extension talks taking place between Dusty Baker and the Nationals, though the skipper says he “ain’t worried” about the situation. Baker is only under contract for one more season in Washington, and his first year in D.C. resulted in an NL East title for the Nats. The White Sox are open to any trades, “but at their price,” according to one rival GM. While this statement is probably generally true for every team, Chicago is known to have a very high price tag on its main trade chips as it looks to rebuild, and the Sox have already landed two big prospect hauls from the Red Sox and Nationals, respectively, in deals for Chris Sale and Adam Eaton. The Nats and White Sox have also been heavily linked in talks about David Robertson, though a source tells Heyman that it has been “over two months” since the two sides last discussed the closer. The Blue Jays talked to Pedro Alvarez before the slugger re-signed with the Orioles on a minor league deal. Toronto has switch-hitters Kendrys Morales and Justin Smoak slated for DH and first base, respectively, though Steve Pearce and possibly Jose Bautista will get some time at both positions as well. Alvarez would have brought some needed left-handed pop to a Jays lineup that is heavy on right-handed bats, and he could’ve also maybe helped out in left field given how Alvarez has been working out as an outfielder this winter. The Marlins are open to adding a starting pitcher. Adam Conley has been struggling this spring, though his issues aside, there certainly seems to be room for improvement within Miami’s projected starting five of Wei-Yin Chen, Edinson Volquez, Conley, Dan Straily and Tom Koehler. Heyman wonders if Angel Pagan could be an option for the Giants given their outfield issues this spring. Hunter Pence and Denard Span have struggled, while Mike Morse and Mac Williamson are both sidelined with injuries, so an outfielder like Pagan capable of playing all three spots could seem to fit as a depth piece. Of course, San Francisco is already trying out many of its surplus infield pieces as potential outfielders, and Pagan is still insisting on a a Major League contract. Byron Buxton and Max Kepler appear to be the only true untouchables on the Twins roster as the team continues its rebuilding process. It’s worth noting that Minnesota only made a couple of minor deals this offseason under the new Derek Falvey/Thad Levine-led front office, despite a lot of rumors surrounding such veterans as Brian Dozier or Ervin Santana. Johan Santana is still hopeful of a comeback, continuing to work out with an eye towards potentially signing with a team for the second half of the season. Craig Gentry, who signed a minor league deal with the Orioles last month, “has impressed Buck Showalter” and is looking in good position to break camp with the team. The O’s could use platoons in both left and right field, with Hyun Soo Kim and Seth Smith as the left-handed bats and Gentry and Joey Rickard providing the right-handed hitting support. This could mean that Rule 5 picks Anthony Santander and Aneury Tavarez may end up back with their old clubs, though Santander could be saved on the DL as he recovers from offseason shoulder surgery, as well as elbow and neck issues this spring. Rebuilding season or not, falling short of the playoffs and finishing with a losing record probably means that more things went wrong than went right for a team. This series, however, will focus on those silver linings that each team can take away from an otherwise disappointing season. Here are the biggest bright spots for each non-playoff team, starting with the Minnesota Twins (worst record in baseball) and working our way up the ladder over the next couple of weeks. Even if the Twins had decided to tear down the big league roster and go through a complete rebuilding phase in recent years, they lacked the trade chip(s) to do it most effectively. The best thing about Dozier’s jump from very good player to superstar in 2016 is that whoever becomes the team’s next general manager will finally have that trade chip that he can flip for a strong package of young players, including an elite prospect or two. The 29-year-old Dozier is only due $15MM over the next two seasons and is coming off a career season (.937 OPS, 41 HR). While there is hope that Byron Buxton, Miguel Sano and a few others can take a step forward in 2017, there probably isn’t enough pitching help on the way for the Twins to turn things around before Dozier becomes a free agent. Therefore, you can expect Dozier to be a popular name around these parts during the upcoming offseason. Much was expected from this season’s projected outfield of Buxton, Sano and Eddie Rosario. All three, especially Buxton despite his late-season surge, have fallen short of expectations in 2016. In fairness to Rosario and Sano, they haven’t been bad. Just not nearly as good as they were as rookies in 2015. The 23-year-old Kepler, who would’ve spent most of the season in Triple-A had that aforementioned trio played better, has taken full advantage. 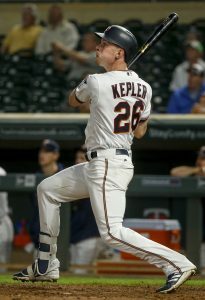 In between a slow start and late-season slump, Kepler was one of the Twins’ best players with an .826 OPS, 16 homers and 15 doubles in 321 plate appearances from June 10th through September 3rd while hitting primarily in the No. 3 spot of the order. He’ll enter the 2017 season as the starting right fielder. When it comes to offensive potential, Polanco has more than enough for a shortstop. The question was whether he was good enough defensively to stick there. When he was called up to the majors in late July following the trade of Eduardo Nuñez, the 23-year-old hadn’t played a single game at shortstop in Triple-A, instead spending most of his time at second base with a handful of games at third. That would suggest that Polanco as the team’s shortstop of the future was no longer an option. But with Dozier entrenched at second base and Sano and Trevor Plouffe drawing most of the starts at the hot corner, the best way to give Polanco regular playing time was to make him the everyday shortstop. Not surprisingly, the switch-hitting Polanco has held his own at the plate—he has a .289/.338/.426 slash line with 18 extra-base hits in 209 plate appearances. The surprise has been his defense at shortstop, which has been adequate, at the very least. If they trade Dozier this offseason, Polanco could slide over to second base. At this point, though, the Twins likely feel comfortable penciling him as the starting shortstop in 2017. Nuñez was in the midst of the best 91-game stint of his career (.764 OPS, 12 HR, 15 2B) when the Twins decided to sell high, trading him to the San Francisco Giants for Adalberto Mejia, a very good, close-to-MLB-ready pitching prospect. Not only did Nunez’s departure open up the necessary playing time for Polanco, the acquisition of Mejia gives the Twins a strong candidate for the 2017 rotation. Between Double-A and Triple-A, the 23-year-old lefty posted a 3.14 ERA. 2.0 BB/9 and 8.6 K/9 in 22 starts. A 4th Round draft pick back in 2013, Gonsalves has now made stops at five different Minor League levels without much of a struggle and without much fanfare. That includes a dominant 13-start stint with Double-A Chattanooga (1.82 ERA, 5.2 H/9, 0.1 HR/9, 4.5 BB/9, 10.8 K/9) to close out the 2016 season. The attention should increase this offseason as the 22-year-old lefty will likely make a huge leap in the prospect rankings. It’s safe to say that his stock has risen a great deal — so much so that it’s reasonable to expect to see Gonsalves in Minnesota at some point during the 2017 season. The Tigers have removed Anibal Sanchez from the rotation and replaced him with left-hander Matt Boyd, as Anthony Fenech of the Detroit Free Press writes. Sanchez took the move as well as could be expected, manager Brad Ausmus told the media, and Fenech writes that Sanchez spoke with conviction about working to correct his flaws and reclaim his job. Sanchez, who is earning $16MM in 2016, the fourth season of a five-year, $80MM contract, has surrendered a 6.67 ERA through his first 56 2/3 innings of the year. He led the American League with 29 homers allowed in 157 innings last season and has allowed an even more alarming 14 long balls in this year’s 56 2/3 frames while also displaying his worst control since 2009 (4.6 BB/9). Sanchez is owed $16MM once again in 2017, and the Tigers hold a $16MM club option for the 2018 season that comes with a hefty $5MM buyout. With offseason signee Mike Pelfrey struggling so greatly as well, the Tigers are definite candidates to seek rotation upgrades this summer, though the emergence of Michael Fulmer and a recent string of solid outings for Daniel Norris at Triple-A may lessen the urgency. The Indians need to trade for an outfield bat in the wake of Marlon Byrd’s 162-game suspension, opines Paul Hoynes of the Cleveland Plain Dealer. Suspensions for Byrd and Abraham Almonte, combined with the shoulder woes of Michael Brantley, has left Cleveland with an outfield mix of Rajai Davis, Tyler Naquin, Lonnie Chisenhall and Jose Ramirez. As Hoynes writes, the Indians “have pretty much said” that top prospects Bradley Zimmer and Clint Frazier won’t play in the Majors this season, so neither Double-A outfielder seems like an immediate option. President of baseball operations Chris Antonetti said to Hoynes that the club will “take some time to determine” if a trade is necessary, and he also explained that the club “spent a lot of time working through” Byrd’s first positive test before electing to sign him. Byrd, of course, went three years between suspensions and passed numerous drug tests along the way. Twins outfield prospect Max Kepler hasn’t seen much playing time in either of his first two stints at the Major League level, but manager Paul Molitor said that this time around, he’ll get more of a chance at regular playing time, writes MLB.com’s Rhett Bollinger. The 23-year-old German outfielder raked at a .322/.416/.531 clip at Double-A last season en route to Southern League MVP honors, and he batted .282/.367/.455 in 30 games at Triple-A after being demoted to Rochester earlier this season. Notably, Bollinger adds that the Triple-A coaching staff recommended Kepler over recently demoted Eddie Rosario, who is hitting .333 since a mid-May demotion but still hasn’t drawn a walk in 51 plate appearances. Travis Snider will not opt out of his minor league contract with the Royals, per SB Nation’s Chris Cotillo (Twitter link). The 28-year-old had a June 1 opt-out date but will instead remain with Triple-A Omaha, where he’s batted .259/.377/.348 in 162 plate appearances. The Royals have lost Alex Gordon to a fracture in his hand for the time being, so perhaps the hope is that a need in the outfield corner will lead to a promotion in the near future. The Twins have made several roster moves involving notable young players, per a club announcement (via MLB.com’s Rhett Bollinger, on Twitter). Outfielders Byron Buxton and Max Kepler have been optioned back to Triple-A, while righty Alex Meyer has been brought back onto the active roster. Buxton, still just 22, entered the year once again rated as one of the very best prospects in all of baseball. He struggled in his debut stint in 2015, but hopes were that his bat would catch up to his glove and speed at the major league level. Instead, Buxton has fallen off even further, and owns a .156/.208/.289 slash and 24 strikeouts (with just two walks) over 49 plate appearances. By sending Buxton down now, Minnesota will give him a chance to regain his footing at Triple-A, where he was successful last year. It also leaves the door open to holding Buxton below one full year of MLB service at the end of 2016. He entered the season with 113 days on his clock, and obviously hasn’t yet accumulated the 59 more days needed to push himself up to 172 days. Needless to say, it’s certainly still possible that Buxton will cross that threshold at some point this year, but that’s no longer a given. Kepler, meanwhile, was only expected to perform fill-in duty. He skipped the Triple-A level last year, and will head back down to continue his development. Danny Santana has been activated from the 15-day DL, which created the need for another roster spot. As the Twins temporarily bid adieu to two important young assets, they’ll welcome back another to the big leagues. Meyer, a 26-year-old righty, lost much of his prospect sheen in a rough 2015. But he’s off to a nice start at the highest level of the minors in 2016, having allowed just two earned runs on 11 hits and four walks over 17 1/3 innings, while racking up a healthy 19 strikeouts. It’s not immediately clear what role Meyer will take when he arrives. He had returned to the rotation this spring, but could certainly be utilized in a setup role for a club that is in need of live arms in the pen. Regardless, it’s time for Meyer to show the organization that he is capable of performing at the major league level. It’s worth noting, too, that despite entering the year with eight days of MLB service, Meyer won’t be able to tally 172 for the present season even if he stays up the rest of the way. Mat Latos has paid huge dividends to the White Sox cin his first three starts for the organization, as Colleen Kane of the Chicago Tribune writes. Since signing for just $3MM in an effort to rebuild his career, Latos has spun 18 1/3 innings in which he’s allowed just six hits and one earned run. While there are plenty of indicators suggesting that Latos hasn’t been quite as dominant as those results would suggest, and his velocity is back down, he’s been in the zone more than ever before and has still managed to induce a lot of easy outs (35.3% soft contact rate; 11.8% line-drive rate). The Royals activated Jarrod Dyson from the DL yesterday after he missed the first several weeks of the season with a strained oblique. Manager Ned Yost says he’ll be deployed in a “loose platoon” with Paulo Orlando, Rustin Dodd of the Kansas City Star tweet. Of course, the left-handed-hitting speedster figures to get a solid majority of the action in that arrangement. Meanwhile, the Royals’ vaunted bullpen hasn’t been quite the well-oiled machine thus far in 2016 that it was in the recent past, as Dodd explores. Really, it’s mostly a matter of some early struggles from Joakim Soria, who has allowed six earned runs on ten hits and five walks over his first seven frames. Notably, he’s only managed to get hitters to chase pitches out of the zone 14.7% of the time, which is less than half his career rate. For now, at least, the club isn’t ready to move him out of the primary set-up job, though Kelvin Herrera and Luke Hochevar have both looked strong. “Our roles are set until we need to change our roles,” Yost says. The Tigers received fairly promising news on the injury front yesterday, as manager Brad Ausmus noted in an appearance on MLB Network Radio on Sirius XM (Twitter link). Catcher James McCann’s absence is expected to land “on the shorter side of the two to four week timetable” that he’d been given for a sprained ankle. (Though it’s fair to note that Jarrod Saltalamacchia has filled in admirably in his stead.) Also, outfielder Cameron Maybin is nearly ready to make his season debut, opening up some options with Anthony Gose off to a slow start.